The search is on for Porirua’s top young employees. Nominations are now open for the Outstanding Young Employee Award 2018. Michelle Robinson, Executive Director for Partners Porirua, says there are many talented young employees making special contributions to their workplaces and this is a chance for employers to recognise that contribution. Ms Robinson says that every year the calibre of nominees just gets higher and higher. 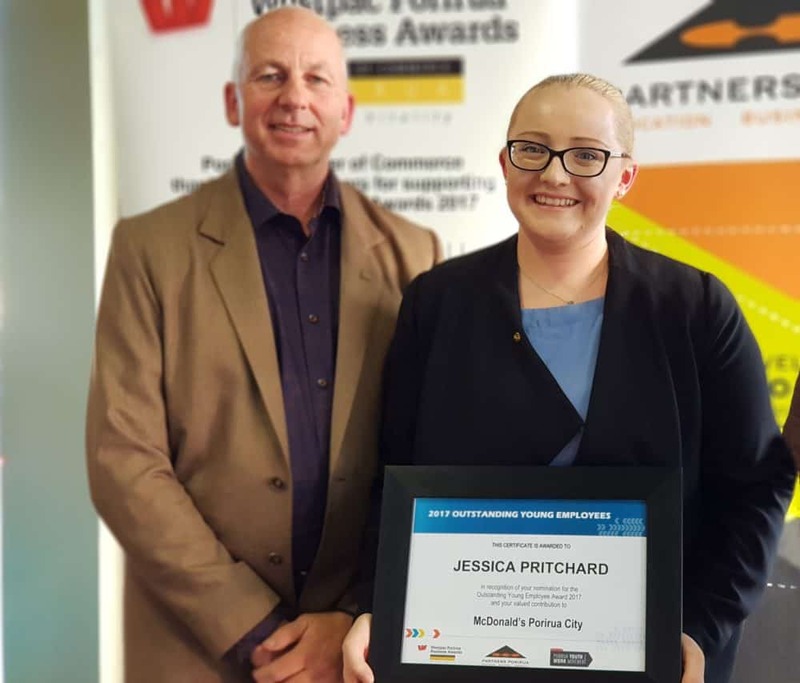 Jessica Pritchard was a finalist in last year’s awards as well as the recipient of the 2017 Dale Carnegie Young Leader of the Year scholarship. Ms Pritchard says winning the Dale Carnegie Leadership scholarship made all the hard work worth it. She says the scholarship has opened new doors for her and given her a whole new level of passion for the great things that youth can achieve in the workplace. Jessica Pritchard at the 2017 young employees’ evening with her then employer, Trevor Campbell from McDonalds. Employers wanting to nominate a young employee can find out more at www.partnersporirua.org.nz or by printing off the application form here or by ringing Jane Hocking on: 022 352 7040.